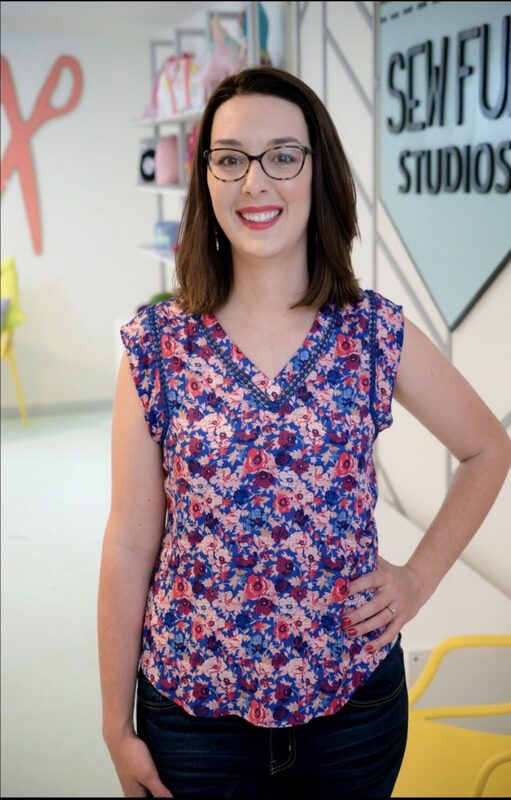 I’m Kaitlyn Baeten, owner of Sew Fun Studios in Frisco, TX! For me, making things has always been a part of who I am. When I was little I used to decorate (and redecorate!) my doll house using tissue paper, random craft supplies, and any leftover art supplies I talked my Mom into letting me use. As an adult, I’ve caught myself on more than one occasion boldly stating “I can totally make that!” My love for creating has never stopped and through the years I have discovered that creating is my “happy place”! My favorite thing about owning Sew Fun Studios is that I get to share my love of sewing with kiddos who may not have been exposed otherwise. Many schools in Texas have removed the home economics classes from the core curriculum, so when folks find us they’re usually pretty excited! We take pride in the experience we provide, always taking care to teach the best methods, use beautiful fabrics, encourage creativity, and to always help our students to create with confidence. Sewing can be a challenge, the Sew Fun curriculum is designed specifically with “little makers” in mind. Our project tutorials have been designed and tested, the end goal being a smooth class where students learn sewing basics, safety, essential sewing skills, machine trouble-shooting, and most importantly, have fun while they’re doing it!! We also love to celebrate sewing as a modern and relevant art, our projects include Unicorns, Llamas, Narwhals, monogrammed items, bags, room decor, and more!! Keeping things fun and whimsical is something we always have on our minds! At Sew Fun Frisco we have an amazing team of sewing instructors! Each one specializes in a unique area and brings their set of skills to our students. From Fashion Design students to those specializing in vintage clothing patterns- we strive to have someone on staff ready to help with all sorts of sewing projects! Most of our students are beginners, ages 7-12. Our staff members are so wonderful at teaching with a heap of creativity, a dash of patience, and a whole lot of love for what they’re sharing. When a student leaves a Sew Fun class, they get so much more than an adorable, handmade project. Sewing encourages problem solving, strengthens fine motor skills and critical thinking, and gives students an outlet for creativity. Our all the benefits, my very favorite is the confidence and pride students get from creating something with their own two hands! We can’t wait for you to join us in one of our custom sewing classes, camps, Girl Scout events, or birthday parties! Learn how to sew and design a project from start to finish.